Creative Commons makes it easy for content creators to define a set of rules under which they would like the public to use their creative work. For instance, if you upload a photograph on the Internet, you can apply a Creative Commons license that would allow others to embed that photograph in a website or use in a presentation but not sell it commercially. The important thing to note about CC licenses is that they are irrevocable. Thus, if you release your images under a particular CC license, others will always have the right to use them under that license even if you later decide to stop distributing the images under Creative Commons. 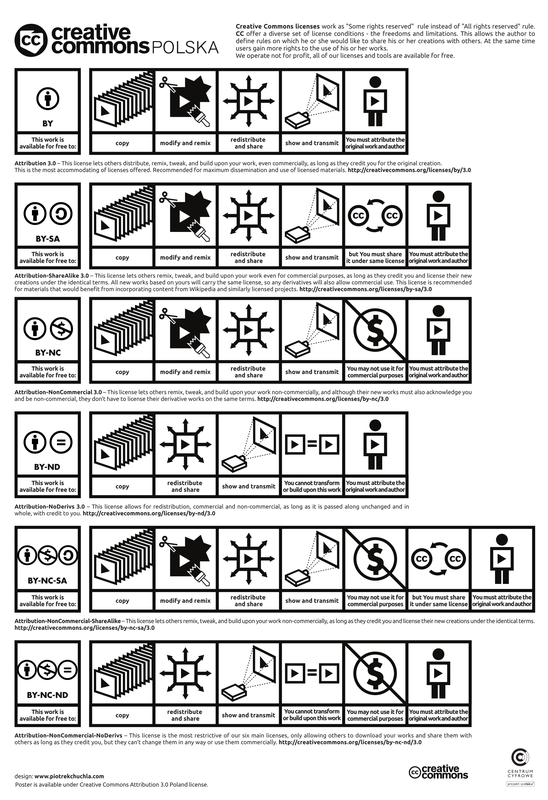 If you have been trying to understand the terms of the various Creative Commons licenses, this comic poster from CC Poland is a good resource to start with. There are 6 types of licenses with separate conditions attached to each of them and you got to understand them well before picking a license for your work. Tutorials creative commonsInfographics [Poster] Which Creative Commons License is Right for me?